Our product range includes a wide range of marble strips. 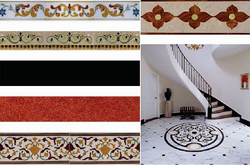 We fulfill ever changing demands of our esteemed clients by providing a classy collection of Marble Strips that are available in several shades, prints and patterns. The strips offered by us are cut and finished by our dexterous professionals with the use of superior quality marble stone and contemporary machines. Suitable to be placed at bathrooms, backsplashes, balconies and kitchens, these strips are sure to impress the visitors through their unique appearance.